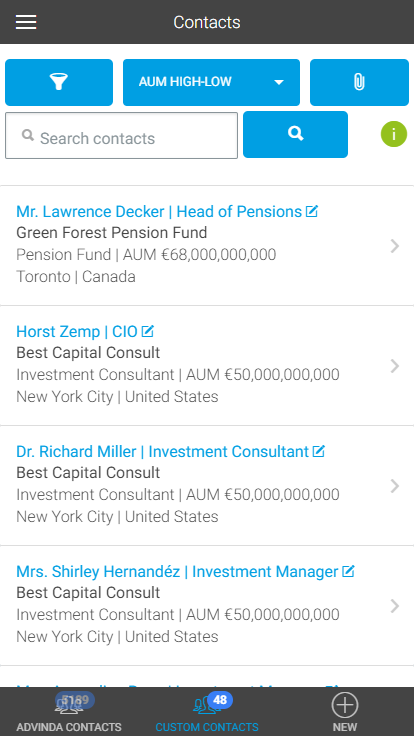 A click on “advinda contacts” displays a table with all advinda contacts you have access to. The number of results depends on the package were assigned by your teams’ admin. advinda Contacts cannot be edited, but will be continuously validated . 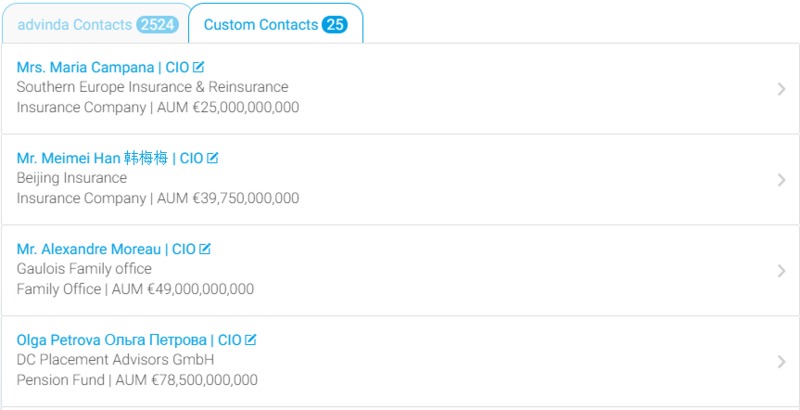 Custom contacts are contacts that have been created by you or by members of your team. Custom contacts can be edited by any team member. Click “Add +” to create a custom contact. 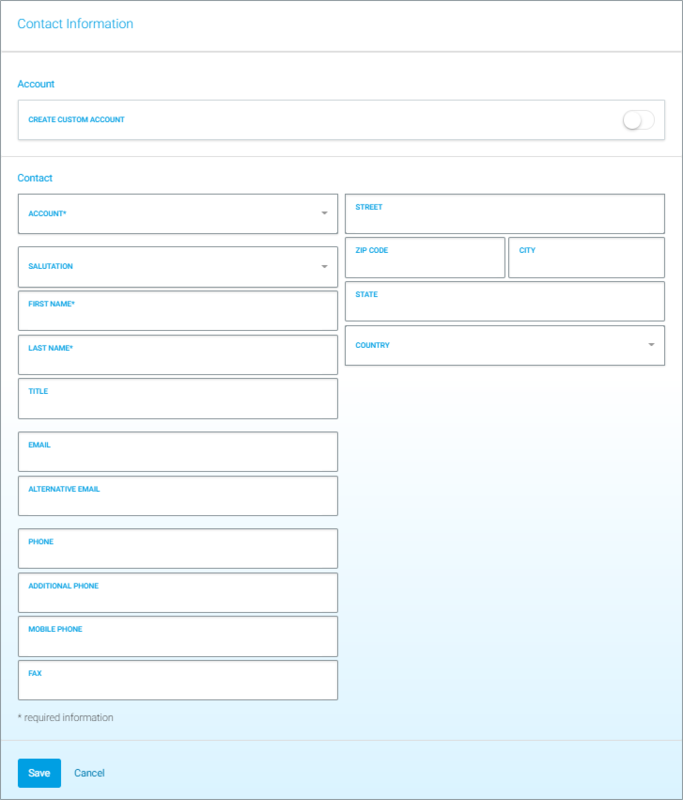 When creating a contact, you have the option to create a custom account as well. Simply click on the switch and enter the accounts details. If you want to use an existing account click the account input box and select an account in the popup. Click “Edit” to start editing a contact. Click “Save” to save your changes. 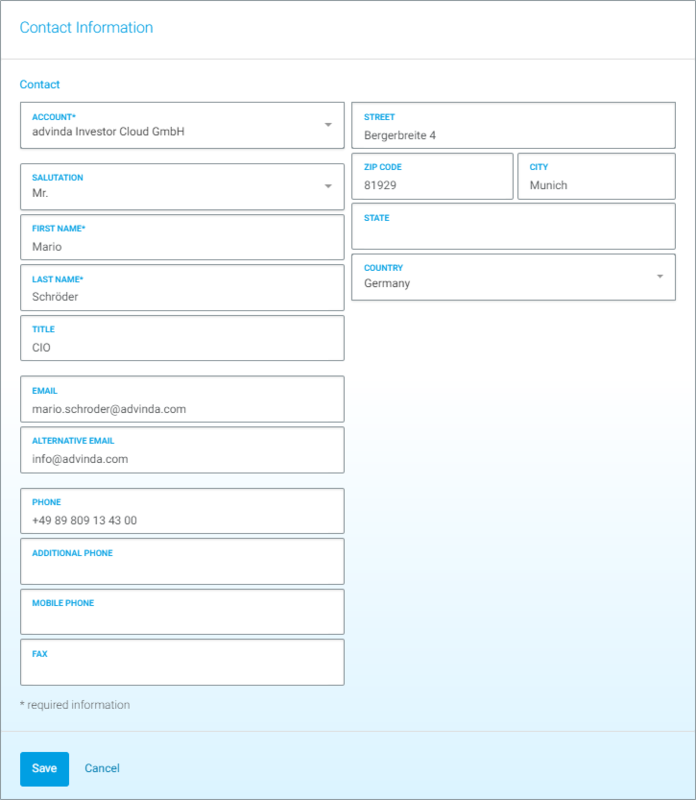 Contact Details shows all available information about a contact. You can add the contact to multiple campaigns by clicking “Add to campaign(s)+”. 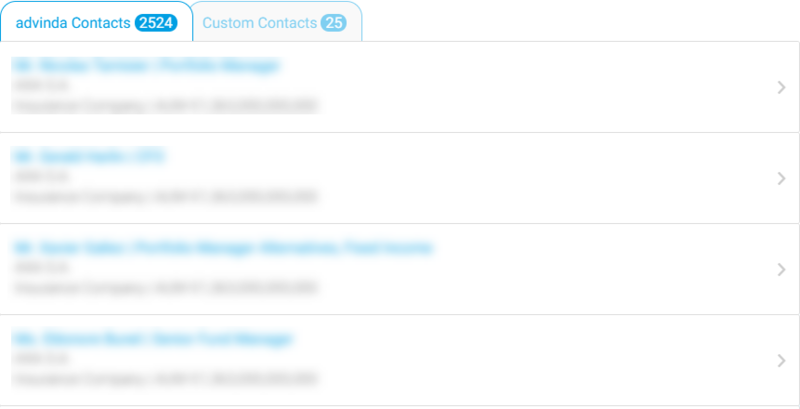 For custom contacts you are able to see a created by and last modified by timestamp. The campaign history card shows all campaign the contact currently is assigned to. The table also shows details about the level of interest, member status updated and date teaser sent. 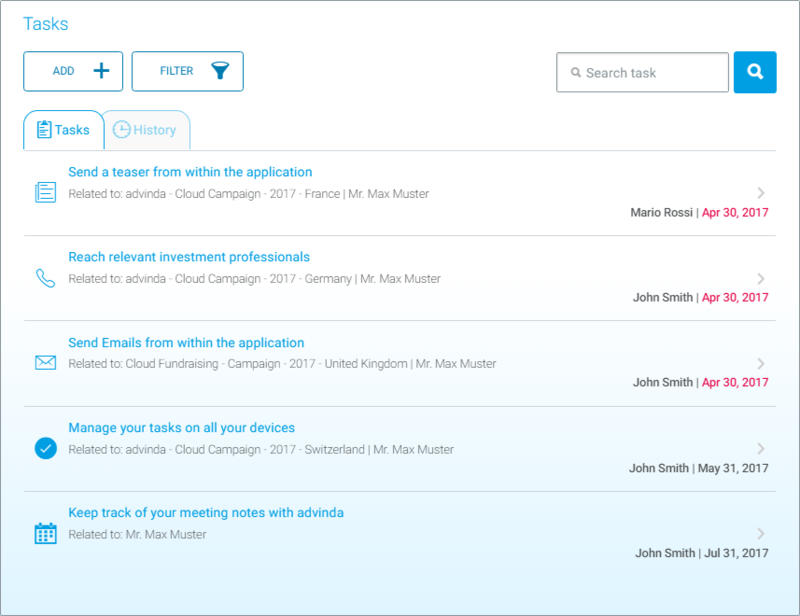 The tasks section shows all tasks and history related to the contact. You can create a new task by clicking “New +”. You can filter tasks by Team member and/or campaign. 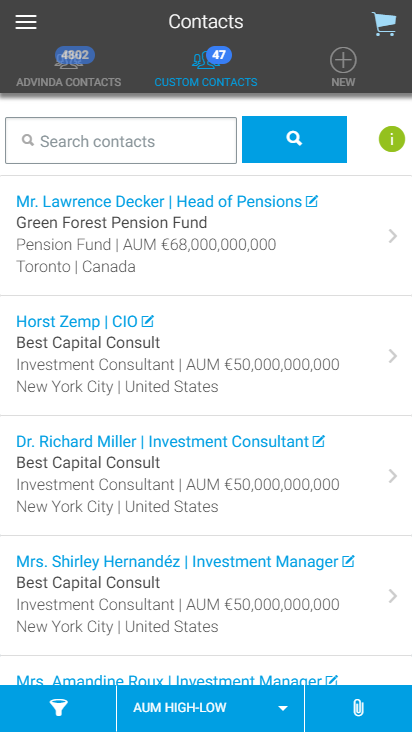 You can navigate between advinda and custom contacts using the bottom bar. Commands can be found at the top. You can navigate between advinda and custom contacts using the top bar. Commands can be found at the bottom.